Our Product - Buddylicious Treats!!! 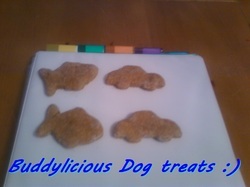 These are a batch of treats we made for our dog Buddy! They are not the only shapes we have to offer. Check back soon to see all the shapes on our "Choose Your Shape" page.